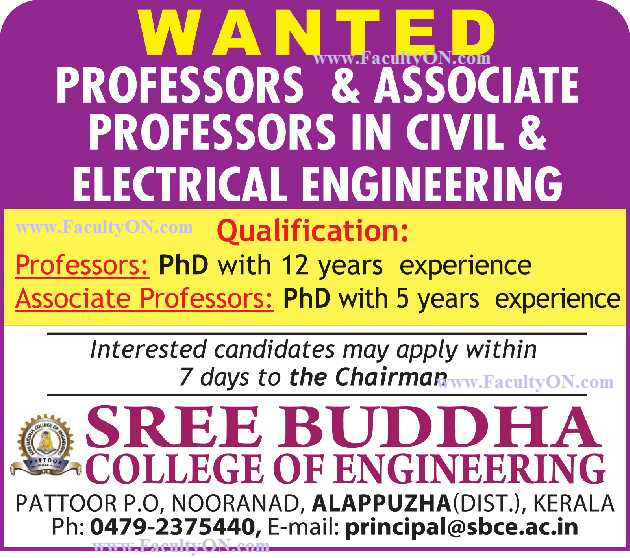 Sree Buddha College of Engineering, Alappuzha has advertised in THE HINDU Opportunities newspaper for the recruitment of Professor Plus Associate Professor jobs vacancies. Interested and eligible job aspirants are requested to apply within 07 days from 15th November 2017. Check out further more details below. About College: Sree Buddha College of Engineering, affiliated to University of Kerala, has been par excellence in technical education. The sermons of Lord Buddha gave us a lead to be the flowers of exaltation. The primary objective is to promote education and research in the field of technology and to replenish the skills that get lurked in the budding technocrats. Each and every member in the family of SBCE pushes themselves to set the institution as an example to the world. How to Apply: Interested and eligible candidates are requested to send their applications containing CV, copies of certificates and recent PP size photo to the postal address.